Transferring iPhone photos to Windows 7 is an easy task that can be achieved via number of ways. You can either use built-in file explorer of Windows, utilize Windows 7 AutoPlay, or you can also use a third-party file transfer tool (i.e. iMyFone TunesMate) to get the job done. iMyFone TunesMate is a state-of-the-art iPhone file transfer tool that you can use to import as well as export your iPhone photos to Windows 7 and vice versa. Using iMyFone TunesMate to import iPhone photos to Windows 7 is highly recommended because it is relatively easier and much faster than other methods. Apart from this, there are many additional features this software offers that you can take advantage of. You can also view and transfer HEIC photos via this software. Two-way transfer feature allows you to conveniently transfer your media files between both your iPhone and your computer. You can also preview pictures before transfer for enhanced selection and transfer experience. 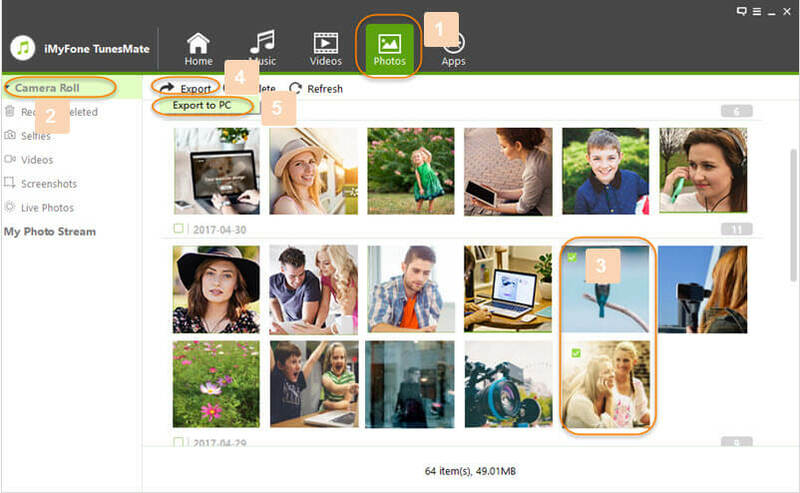 1-Click backup photos to PC feature to conveniently backup all your iPhone photos. iTunes library management; you can use iMyFone TunesMate to rebuild corrupted iTunes library as well as merge multiple libraries conveniently. Transfer purchased as well as non-purchased media without hassles. Efficient playlist management; create, delete, rename, import, export your iPhone music playlists. Step 1: Run iMyFone TunesMate software on your Windows 7 computer and then connect your iPhone to it. 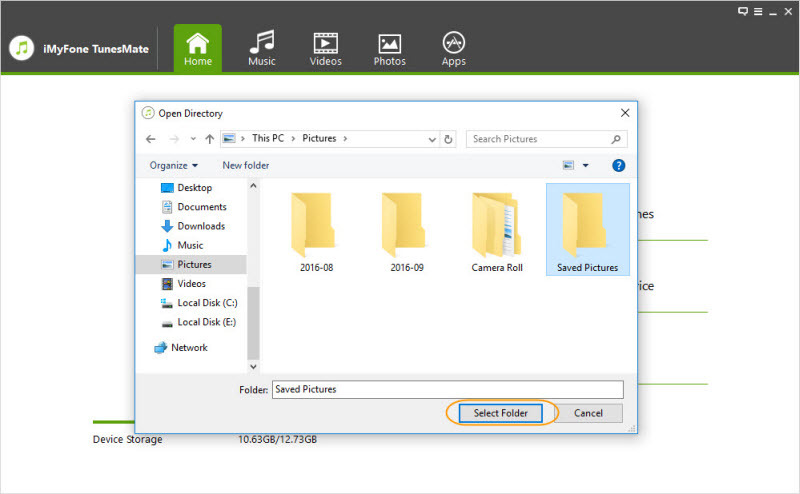 Step 2: Now select Backup Photos to PC option available on the main page of the software. Step 3: You will be asked to select destination folder for exported photos, choose one on your computer’s hard drive and then click on Select Folder option to proceed. 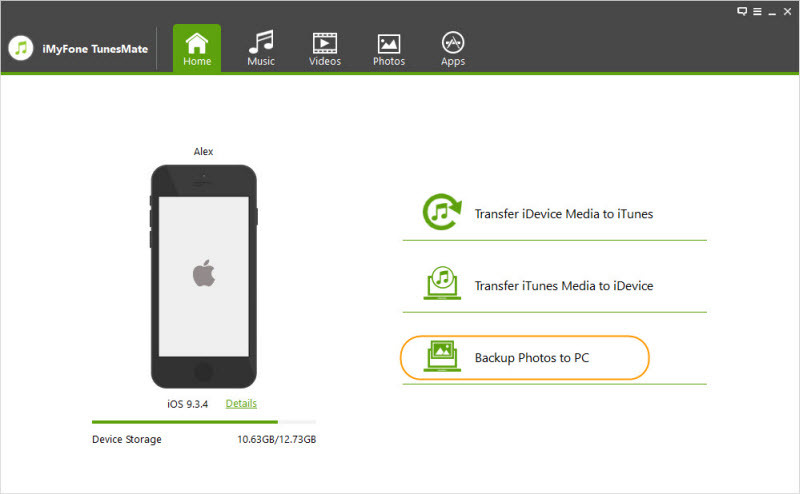 The transfer process will start and all your iPhone photos will be exported to your PC. You will also be notified once the transfer process is completed. The process to import your iPhone photos via Windows 7 file explorer is also quite easy. However, keep in mind that you can only import JPG photos with this method. HEIC photos cannot be previewed via Windows 7 File Explorer. First make sure iTunes is installed on your computer, so that your iDevice is detected and there are no compatibility issues. Step 1: Connect your iPhone to your PC via USB cable. And open Computer. Step 2: Now click on the iPhone sub-menu (your device’s name may be shown here). 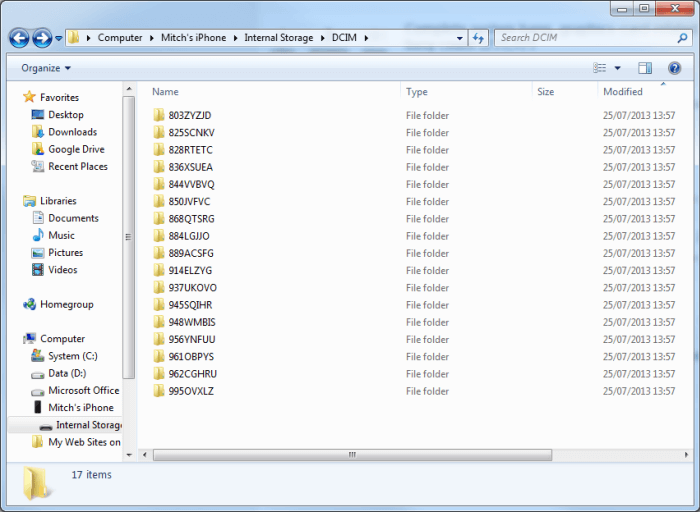 Step 3: Navigate to DCIM folder in the Internal Storage and then select the photos you wish to import to your PC. Step 4: After the selection, simply use Windows’ copy feature (right-click and choose Copy) and then Paste it (right-click and choose Paste) in your desired folder on your computer’s hard drive. Your selected photos will begin transferring. 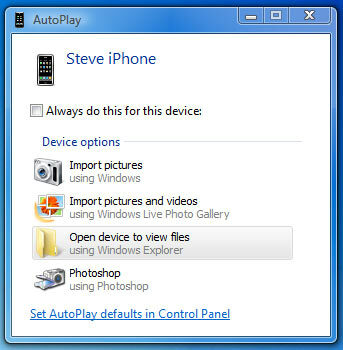 You can also import your iPhone photos to your computer via Windows 7 AutoPlay. However, just like the above mentioned method you cannot view HEIC photos with the AutoPlay as well. So this method is also only suitable for transferring JPG photos. Make sure iTunes is installed on your computer. If not, download and install it on your computer first to ensure that there are no compatibility or detection issues. Step 1: Use a compatible USB cable to connect your iPhone to your PC. Now, AutoPlay window will pop-up automatically. Step 2: Click on Import pictures option. Step 3: Then select your desired folder on your computer to start the import process.